I've been labelled a snowdome snob for my cheap shots against stencilled snowdomes. I admit my guilt. What makes my heart sing are the blue backed domes with a pedigree label inside. What about Treasure Chest dome's? Well, they aren't common, and may be good to collect, but for me, finding a treasure chest must be like like kissing your sister. It doesn't seem to be very exciting. These are the only three I own, all purchased because there were no other domes for sale. However, I've become older and wiser, realizing that the stencilled generic domes are slowly taking over the shelf space in our snowdome emporiums. So here's some good words about treasure chests.. I hope more will find their way into my collection. 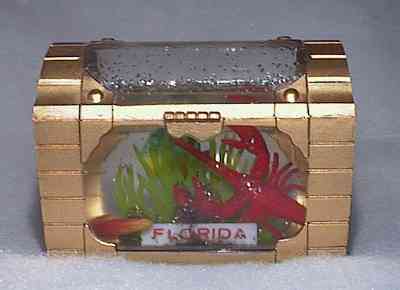 The treasure chest snow shaker is usually found at any tourist stop near water. Sometimes they make their way inland. This one came from a road stop in Georgia, (The Adcock Pecan Store?). It's a generic tourist dome with the plastic dish and seaweed inside. Identical domes are found, I'm sure, in New Orleans, Galveston and other ports of call. In this sample, the plastic fish has died and is lying on its side, but life goes on. Algae and other bugs have taken over the Florida plaque. Although the famed Monterrey Aquarium is nearby, there are no fish inside this snow shaker. Instead, it shows the Lone Cypress one of the most photographed trees on the California Coast. 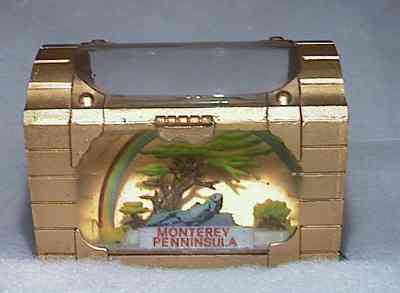 You can see it on 17 Mile Drive out of Carmel..
Where Miss America is no longer crowned. Purchased at a casino on the Boardwalk. How many know that the properties in the Parker Brothers Monopoly board game were named for streets in Atlantic City? Many East Coasters only see this city as just the end of a long bus trip from New York City for gambling junkets. Of course. 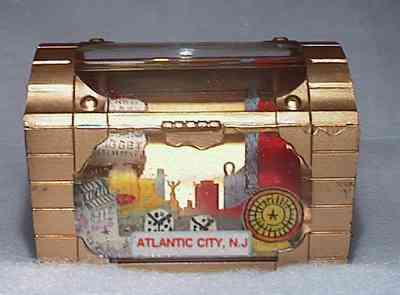 Las Vegas snowdomes were recycled to make Atlantic City shakers. Even so, there's a lot of detail here in this treasure box. 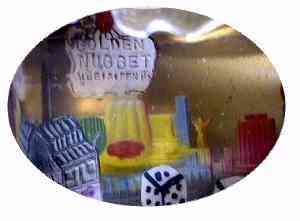 In front, we have a slot machine, dice, and a roulette wheel, but the fun part is the marquee for the Golden Nugget which has some undecipherable cryptic characters underneath. "HEEFAIFENHN."